Evan Tironese scored twice to lead the Alberni Valley Bulldogs to a 5-4 victory over the Surrey Eagles at the South Surrey Arena on Sunday afternoon. Edward Dyson made 26 saves in the losing cause for the Birds who fell to 3-3-0-0 on the season. In the first period, the Eagles got into penalty trouble and the ‘Dogs made them pay for it. Evan Anderson opened the scoring for Alberni Valley at 12:57 of the opening frame while Nic Pierog watched from the sin bin. Before the period was out, Kurt Gosselin doubled the lead for the Bulldogs with Devon Toews in the box. The two teams each scored twice in the second period. 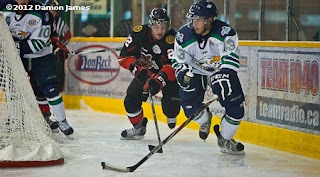 First, Alberni took a 3-0 lead when Tironese beat Dyson at 5:28. But just over two minutes later, Stefan Burzan scored his first goal as an Eagle to put Surrey on the board. The Bulldogs retook the three-goal lead at 9:11 when Tironese netted his second of the afternoon, and with just over a minute remaining in the sandwich stanza, Brett Mulcahy found the net, scoring his team leading fourth of the year to make the score 4-2 in favour of the ‘Dogs after 40 minutes. The Birds pulled to within one goal early in the third when Demico Hannoun beat Alberni Valley net minder Brad Rebagliati high on the glove side for his third marker of the season. But the ‘Dogs weren’t done yet as Nathan Craft put his name on the score sheet with an unassisted goal to give his team the two goal lead. Devon Toews answered back for the Eagles at 12:49, but Surrey couldn’t get an equalizer, despite a number of good chances late in the game. Specialty teams proved to be a key factor in the loss for the Eagles. Alberni Valley went 2-for-4 with the man advantage while the Birds were 0-for-4 on the power play. Trevor Cameron didn’t play for Surrey after he was handed a three game suspension for his fight with Jaden Schmeisser in Friday’s win over Victoria. He’ll be eligible to return to the line-up on October 5th when Surrey hosts Prince George. The Eagles get back at it on Friday evening when they pay their first visit of the season to the Poirier Sports and Leisure Complex to face the Coquitlam Express. The face-off will be at 7:00pm.